For Ginny Gilder, the long—and often lonely—road to the Olympic podium began on an autumn afternoon in 1974 on the banks of the Charles River in Boston. A 16-year-old struggling with the chaos of adolescence and family turbulence, she stood on shore watching a race and fell in love with the beauty and harmony of a well-rowed shell in motion. How do they make it so beautiful, she wondered; I wish I could do that. Little did she know that this would be one of the pivotal, defining moments of her life. Ginny started rowing at Yale University in 1975 during an era when women had just begun to step out from the sidelines of athletics into the spotlight. A participant in the famous Title IX naked protest which helped to set the stage for gender equality in college sports, Ginny trained for nearly ten years before she had the opportunity to represent her country at the Olympic Games. Along the way, she overcame countless physical, psychological and even political barriers, including her short stature, sometimes debilitating asthma, a coach who didn’t believe in her, a broken home, a persistent fear of loss and the U.S. boycott of the Moscow Olympics in 1980. Though these challenges often blew her off course, she rowed her way to an Olympic silver medal at the 1984 Olympics in Los Angeles. 1. Always do what you love. What I have learned is that the best thing you can do for yourself is to do what you love. It’s not always easy, but I truly believe that the heart wants what the heart wants. I appreciate the courage of anyone who is willing to put herself on the line and take a risk for what she loves. For me, I fell in love with rowing at first sight and raced for the pure joy of it for more than a decade. When I stopped rowing, I found new avenues of meaning, self-expression and inspiration. What you love may change as you grow, and your challenge is to turn that passion into purpose. And, rather than focusing too narrowly on the achievement, remember the day-to-day experience. When you immerse yourself in learning and growing and learning some more while doing what you love, life is a grand adventure. 2. Figure out how to believe in yourself. Don’t let other people decide what you do, who you’re going to be or whether or not you’re good enough. Don’t give away your control. If you want to become a world-class athlete, a world-class anything, be ready to battle yourself as much as you battle your competition. A big part of winning is balancing the fear of failure with the desire to prove yourself. When you’re in the middle of a race, the future vanishes in the heat of the moment. As your fear recedes, everything else settles into the background and there is only you. So believing in yourself is a critical ingredient in being able to rise to the occasion. 3. Don’t give up too soon. There is no such thing as an overnight success. If you love your sport, you have to love all of it, and you have to be ready for everything it involves, including the pain, exhaustion and fear. Don’t underestimate what the universe is going to require of you if you want to do something amazing. The process of success involves striving beyond your limits, aspiring to perfection and falling short, then trying again and reaching even higher. The beautiful thing about sports is that you are continually presented with the choice of whether or not to push yourself. To me, there is nothing more awe-inspiring than witnessing otherwise ordinary people attempt extraordinary feats that stretch them to and through their limits with grace, grit and humility. 4. You learn more when you lose. There is no way to learn how much it hurts to lose except by doing it. As you travel the road to fulfill your dreams, you have to develop an intimate personal relationship with failure and face it with determination. Often, losing—along with the anger, frustration and humiliation that accompany it—is a precursor to success, pushing you to discover the full potential and power of your will. In my experience, a spectacular failure can be the greatest motivation and the most effective way to inspire improvement and achieve success. By highlighting the distance between your dreams and your reality, losing reminds you of what’s important and why you care. It’s the voice in your head telling you to recommit and get back to work. 5. Hard work is important. Whether you are aspiring to reach the highest echelons of your sport or trying to break a personal best in any endeavor, there is no substitute for hard work. If you’re attempting to go somewhere very few other people have been, you can’t expect it to be easy. Success requires hard work that goes beyond the physical; you will need to train your body, your mind and your attitude. But remember that hard work is subjective. It’s hard if you say it is. It’s a challenge if you believe it is. And it’s an opportunity to get better if you choose to see it that way. So much of reality is a function of how you choose to perceive it. You have the power to label your perspective and when you view hard work as part of the process of winning, it no longer feels like a sacrifice. Whatever you decide to call it, you have to embrace hard work as part of the sport you love. Ginny believes that the life-changing lessons learned in sports extend far beyond the athletic arena to affect every corner of your life. That’s why she has dedicated her post-Olympic career to inspiring and motivating other people to pursue their dreams. She finds joy in generating access to opportunity, especially for those who face steeper odds, so people can change their lives for the better. Today, Ginny’s endeavors combine her love of business with her passion for sports and her deep belief in its power to transform lives. 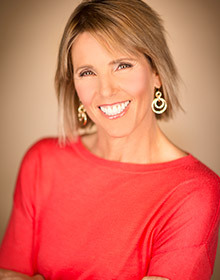 In 2008, along with fellow civic leaders Lisa Brummel and Dawn Trudeau, Ginny helped create Force 10 Hoops to purchase the Seattle Storm, the first woman-owned team in the WNBA. As a company, Force 10 Hoops is guided by the philosophy that women should enjoy access to competitive opportunities at every level of sports. More recently, Force 10 Hoops' newest business venture, Force 10 Performance, developed one of the leading, community-based multi-sport training facilities in the world, offering affordable access to athletes of all ages, abilities, activity levels and aspirations. Learn more about Ginny Gilder’s quest for Olympic gold and how she learned to allow love to triumph over fear, in sports and in life, in her gripping memoir, Course Correction: A Story of Rowing and Resilience in the Wake of Title IX, available in hardcover now and releasing in paperback in April 2016. Morgan Stanley Smith Barney LLC reserves the right to change or terminate the Reserved program at any time and without notice. Reserved program participants accounts and activity are reviewed periodically to confirm that they continue to qualify for this program. The views expressed are those of the author and do not necessarily reflect the views of Morgan Stanley Wealth Management or its affiliates.